"Lonesome" Lester Armistead is a shy and retiring retired printer now raising grandchildren on his farm in the Luton's District of middle Tennessee. He rarely speaks above a whisper until he uncorks his jug, gets a whiff of greasepaint and footlights, and releases his Force Five tenor voice in song. 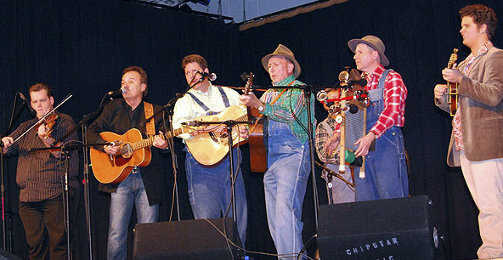 Lester and his late brother Jack performed extensively in Tennessee's Davidson County environs as a country duet years ago. They grew up around the Acuff's Smoky Mt. Boys, as their dad co-owned a bait store with Acuff's fiddler Howdy Forrester. Lester learned to sing from Bashful Brother Oswald - on this all music scholars agree. When Lester sings, Oswald lives. Lester blows a jug that Os played on the Opry as long ago as 1939. Lester also picks a mean banjo. Mostly, Lester likes to laugh. When Marty Stuart asks, "Lester, how's your jug? ", the invariable answer is " 'bout half ". Sadly, due to this recession they've had on in the country, Lester has had to set up a goat farm to earn enough money to continue his clog dancing lessons. As Roy Rogers was to the Sons of the Pioneers, so Leroy Troy - "The Tennessee Slicker, the Sultan of Goodlettsville, the most popular man in country music" - is to the Tennessee Mafia Jug Band. Leroy has the "star power", having performed his astounding old time banjo act since the 1980's at the Knoxville World's Fair, in the cast of "Hee Haw", on many recordings, on the high seas, at concerts and festivals all over this country in Canada and the British Isles, in Branson Missouri, and lately as a regular on Marty Stuart's show on RFD TV. He's a past Champion and Grand Marshal from Uncle Dave Macon Days in Murfreesboro Tennessee. Leroy gives all credit to old time Opry stars the Bailes Brothers, who taught him show business. Leroy sings the lead on old tunes like Charmin' Betsy, and besides banjo he also plays an elaborately outfitted scrubboard, after the fashion of long-ago Opry star Robert Lunn who played the scrubboard in Acuff's show. Leroy has the Three T's, tone, taste and timing. Not every wannabee knows the proper time to put in the duck call vs. the bicycle bell. Leroy's grin and eyes are hypnotic - he connects with an audience. Just try to look away. Actually, don't do that, he'll point you out to the rest of the audience and ask what's wrong with you. In the rhythm section with the bass fiddle you'll often find Ernie Sykes. Ern was born and half-raised on Long Gisland in New York (USA), and he loved it so much there that he moved to the South as soon as he learned to read a map and compass in Cub Scouts. 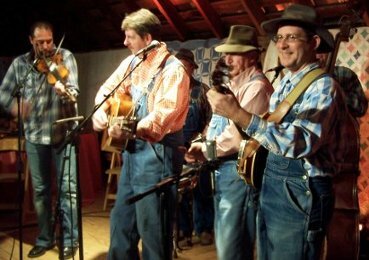 Ernie is another musician who can't hold a real job, and has played with his family band, the Bluegrass Cardinals, the Lonesome River Band, Irish ceilhi band The Aisles of Langerhanz, and notably was the final bass player in Bill Monroe's Blue Grass Boys. This lifetime of underemployment has made Ernie a Master Entertainer in the grand Catskills and Broadway (mainly Robert's Western Wear) tradition, which is why he now works with a cigarette and a drink in hand, and his bow-tie undone. As if there was no beginning to Ernie's talent, he also does the third-best Lester Flatt imitation on two feet. Ernie sings a good country song, and he also sings bad country songs. The band knows better than to leave "dead air" on the microphone, since Ern has a move to the backboard to beat LeBron James, and he has an endless store of ad libs, non sequiturs, real sequiturs and unflattering asides about his bandmates. That's the muttering you hear from the back of the stage while Leroy is strapping on the scrubboard. In addition to music, Ern's resume includes arrest (no conviction) for the kidnapping of guitarist Leon Rhodes, third-billing in a horror movie, cut-man for boxing legend Donnie Pendleton -13 (5 KO's) and 166 (33 KOs), and summer replacement DJ at Deja Vu Gentlemen's Club until he got caught stealing downloads. Ernie learned a mean "butter paddle buck and wing" from the late Chick Stripling, which he features at Bar Mitzvahs. Don't ask for it, you can't afford it. If the Jug Band can be said to have a brain, that would be guitar man and booking agent Mike Armistead, Lester's son and heir. Mike shares lead singing duties with Leroy, sings harmony in the trios, books the band, engages sidemen to play Dobro, runs the mercantile empire of their recordings, hoss trades in knives, dogs and guitars, and is the Jug Band's tenuous contact with the twenty-first century. Like his dad, Mike has a taste for strong tenor singing and loves the repertoire of Bashful Brother Oswald and Ira Louvin. Mike is the wheeler-dealer of the outfit, with contacts throughout the entertainment bidness. He's a graduate of the very first International Bluegrass Music Association Leadership School, if you're a student of "faint praise". He also serves the citizenry of Nashville with the Fire Dept. and received the coveted "Hero of the Soviet Union" medal for his life-saving work in the dreadful 2010 Nashville Flood. While Lester and Leroy are the obvious cut-ups on stage, Mike is the schemer ready to bring anything into the show that will entertain. Mike can smell any kind of activity that makes money. In fact, he's considering a career shift to elected office. Shad's intricate and soulful style of fiddle playing has been compiled over the years from many of his early influences. The playing of such legendary fiddlers as Vassar Clements, Sam Bush, Art Stamper, Mark O'Connor, Kenny Baker and Byron Berline helped develop Shad's playing throughout the earliest part of his musical career. Shad Cobb's present-day virtuosity puts him at the forefront of top fiddlers in the country. Whether on one of his recordings, or in a live setting, the playing of Shad Cobb is quite an amazing thing to witness. Born in Hazelville, WA, Shad Cobb began playing the fiddle at the age of thirteen, and his career started early with his family band that included his father and brothers. In '95, Shad moved to Nashville and began recording with some of Nashville's top artists, including such acts as Bluegrass legends and Grand Ole Opry members the Osborne Brothers, vocalist Marty Rabon with his band Shenandoah, Country music icons like Willie Nelson, singer-songwriters like Steve Earle, and old-time and bluegrass musician/comedian Mike Snyder. Shad currently tours with the John Cowan Band and Tennessee Mafia Jug Band. Grand Ole Opry announcer Eddie Stubbs calls Mike Webb " a great disciple of Brother Oswalds school of music". A very fitting title and one Mike Webb wears well. This Tennessee native learned to play guitar at the age of 14 from his Dad. Music was always a part of the Webb household. Saturday nights found family and friends gathering for some music and fellowship at their home. After a few years playing guitar Mike took a keen interest in the dobro style of Bashful Brother Oswald, who he frequently listened to on the Grand Ole Opry. A few years later he got the chance meet the dobro icon backstage at the opry. It was evident to those present at that first meeting that the two had much in common, and a bond was formed. Oswald began teaching Mike the old time mountain style that he had made famous with Acuff. "I spent so many wonderful afternoons sitting knee to knee with Os , learning the old time style he created ". It wasn't too long before Charlie Collins had mentioned Mike to Wilma Lee Cooper who was looking for a dobro player. As fate would have it Mike soon found himself on the stage of the Grand Ole Opry in Wilma Lee Coopers band the Clinch Mountain Clan a time he holds dear to his heart. In 1999 he began working with another Roy Acuff band member, guitarist Charlie Collins. " Charlie is one of my heros and I love working with him , he's from the old school". With longtime friends Kent "Superman" Blanton and Robert Montgomery aduiences are treated to more than just great music, but an educating journey back in time to the early days of rural stringband music. His lastest album contains songs written by the late Ira Louvin of the Louvin brothers as well as self penned songs. Joining him on the album are Marty Stuart , bluegrass legend Bobby Osborne as well as Acuff guitarist Charlie Collins. Mike Webb has traveled the country appearing at festivals as well as private events. He along with Charlie Collins has hosted the Ernest Tubb Midnite Jamboree on WSM , performed at various festivals around the country as well as appeared on Grand Ole Opry live and is regularly seen on RFD TV on the Cumberland Highlanders Show. Mike can often be found at the Country Music Hall of Fame performing his dobro style. An avid collector of country music and grand ole opry memorabilia Mike has a vast and rare collecion. And speaking of memorabilia Mike's instruments are country music history relics themselves. The dobro, well thats Bashful Brother Oswalds dobro you hear him play, and Oswald's banjo as well. After Brother Oswalds passing he aquired them from his widow Mrs. Kirby who stated " he wanted you to have them so they would continue to be played". And so the torch was passed, and I can't think of a better person to keep it burning.